From left, Keona Yorke, sister of swimmer Kael Yorke, swimmer Dylan Carter, Shanique Bascombe, Yvette Wilson, mother of Jereem Richards and Nicholas Paul pose with their awards at the TTOC’s annual Awards, held yesterday at the Hyatt Regency Hotel, Port of Spain. 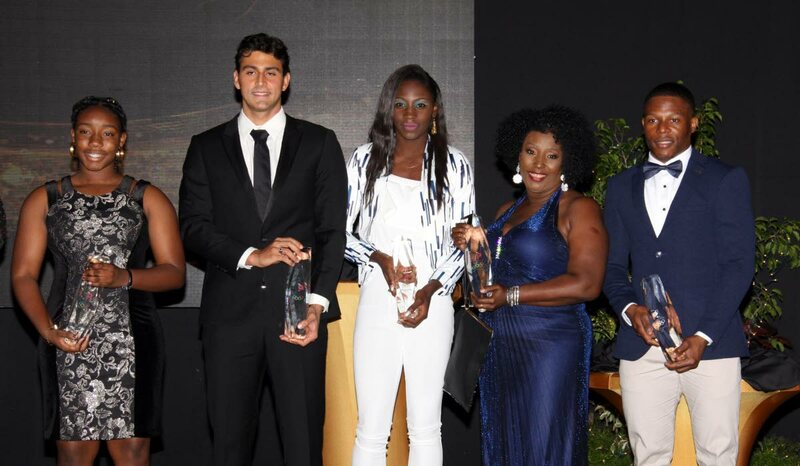 JEREEM Richards and Michelle Lee-Ahye (Athletics) were selected Sportsman and Sportswoman of the year 2018, at the 24th annual TT Olympic Committee’s (TTOC) awards ceremony, held yesterday at the Hyatt Regency Hotel, Wrightson Road, Port of Spain. The Sportsman of the Year award was a lot closer than previous years as cyclist Nicholas Paul and swimmer Dylan Carter also had outstanding performances throughout 2018. However, Richards got the notch as he claimed a Commonwealth Games gold medal in the 200 metres with a time of 20.12 at the Carrara Stadium, Gold Coast, Australia. Richards’ mother Yvette Wilson attended the ceremony to collect the award on his behalf. The 24-year-old “The Dream” Richards, stamped his name on the world stage in 2017 with a bronze in the men’s 200m World Championships final with a time of 20.11secs. The 26-year-old, Ahye retained her Sportswoman of the Year award with her most notable accomplishment for the year being winning gold in the Commonwealth Games in April this year. She stopped the clock at 11:14 secs to win the women’s 100m, at the Carrara Stadium, Gold Coast, Australia and became the first woman from this country to win a gold medal at the Games. On hand to collect her award was manager Afeisha Wright. The People’s Choice Award went to cyclist Nicholas Paul. The award was determined by fans who voted online before the December 23 deadline. A new category to the ceremony, the Future is female award went to Teniel Campbell for cycling. The Junior Sportsman and Sportswoman of the Year awards went to Shaniqua Bascombe (Athletics) and Kael Yorke (Swimming). Veteran broadcsster, David Lamy won the Alexander B Chapman Award for his service in the media. The award recognises outstanding contributions to sport and Olympism. President, Paula-Mae Weekes, Minister of Sport and Youth Affairs, Shamfa Cudjoe and Mayor of Port of Spain,Joel Martinez were in attendance to help with the distrubution of awards. The guest speaker of the evening was former Olympian Candice Scott (Hammerthrow) who spoke about the challenges she faced and eventually overcame in her sporting career. Reply to "Richards, Ahye take top male and female crowns"